history of film, and it's a love letter to journalism." "Brimming with passion and conviction – just like its hero, and its creator." at inspired moments becomes a worship of pure energy." Packing more dynamite into eight reels than most directors unleash over a career, Fuller's self-financed Park Row is a passionate, idiosyncratic work of gritty myth-making. 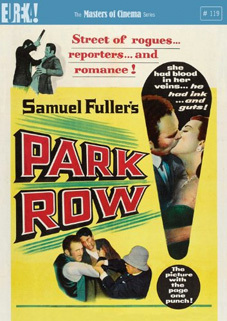 Park Row will be released on UK DVD by Eureka Entertainment as part of the Masters of Cinema series on 22nd October 2012 at the RRP of £17.36.